Because I milked my friend’s goats last week for her and am not too fond of goat milk on its own, I ended up with gallons of goat milk in my refrigerator that had to be used. My first attempt at making fresh chevre didn’t work out too well, but my second attempt worked so well that I made two more batches. One of them was Ricotta cheese. 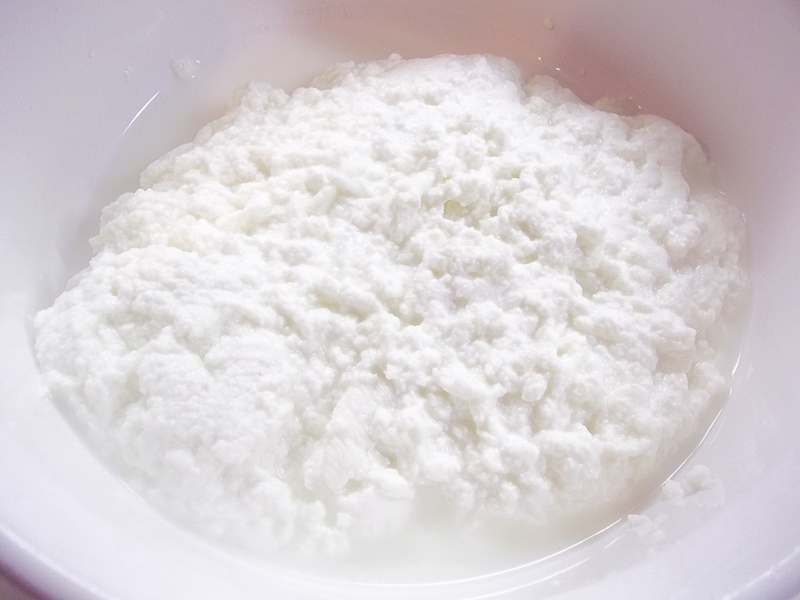 Ricotta is made from whey. I only had last week’s whey left over from my first batch of cheese and didn’t trust it. 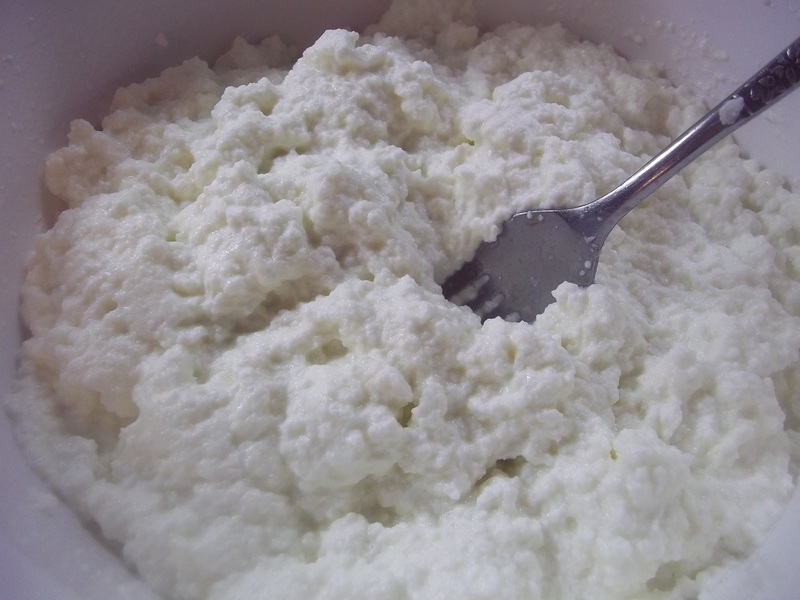 I found a quick ricotta recipe that was so simple. I have saved all of yesterday’s whey for making the “real thing” tomorrow. It has to acidize over a period of time. The quick version was so good that when compressed it has the taste and texture of mozzarella. This is a variation of several that I researched. Temperature seems to be the key element. It was so quick and easy that I had fresh Ricotta in about 15 minutes. I am going to try it with commercial pasteureized/homogenized milk and the pasteurized, non-homogenized cow’s milk that I get from a local creamery to see if I get similar results. With a candy thermometer hanging on the inside of a stainless steel stock pot, pour in one gallon of milk. Heat while stirring constantly to 195F. The goat cheese lady at my local farmer’s market insisted on 185 being the minimum temperature for the milk to curdle. I found this to be true as my first batch of goat cheese was made by following instructions that said to heat it to 175. The higher temps. helped me achieve success. Be careful not to let the milk scorch on the bottom of the pan. I neared disaster when I kept missing the spot where the glass thermometer was hanging. I was able to save it but felt the bottom getting sticky in that area. When the temp. reaches 195, remove the pan from the heat and stir in the vinegar. Stir constantly for a few minutes and then let the whole pan sit for a few more. 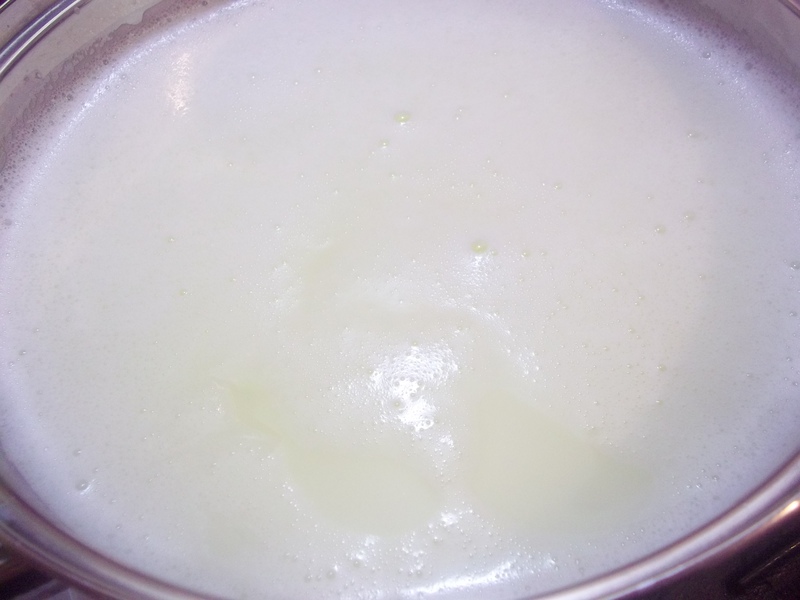 It should have seperated into lumpy curds and whey almost immediately after the acid was added. While the curds and whey sit, prepare a colander by lining it with cheesecloth or an old t-shirt that has been sanitized. I heated mine in the dryer on high for about 15 minutes, figured that should do the trick. 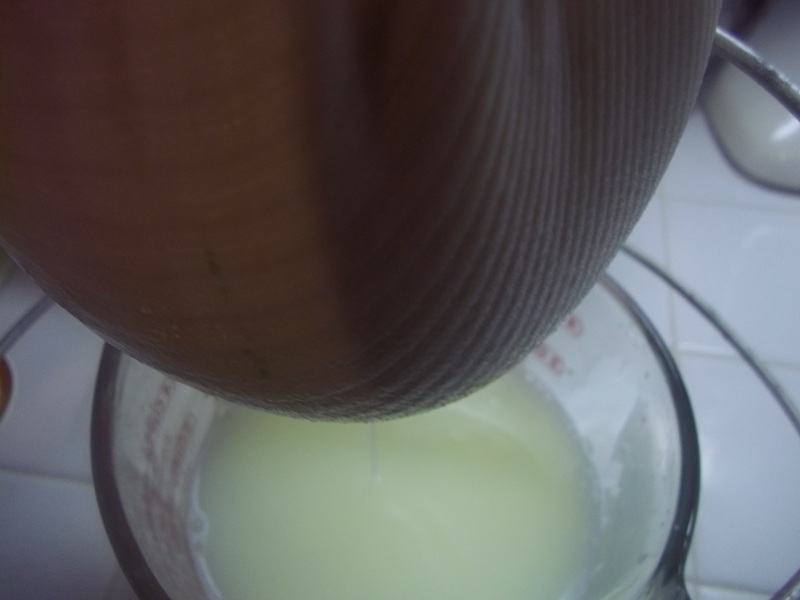 With my earlier cheese making I found that unless you use several layers of cheese cloth, the curds can squeeze through. That was the batch that didn’t curdle very well, though. It may work fine in this recipe. Place a large bowl or pot under the colander. 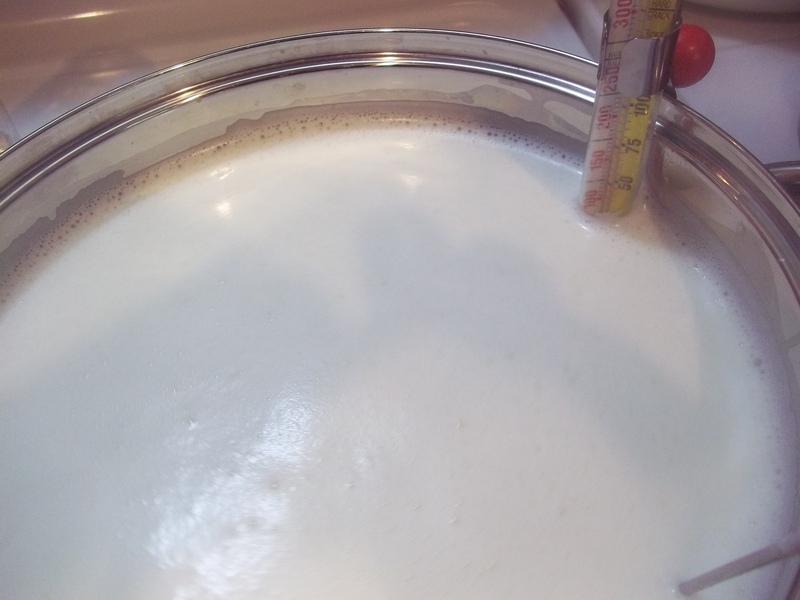 There will be a lot of whey with very little curd, so you may end up racing around trying to find a bowl to switch out when the level begins rising dangerously close to the top of the bowl as I did. It’s very hot liquid, too, so be prepared. Let the curds drain for a few minutes. It should remain wet like commercial Ricotta. Empty into a bowl that has been sanitized with hot soapy water and rinsed in very hot water. 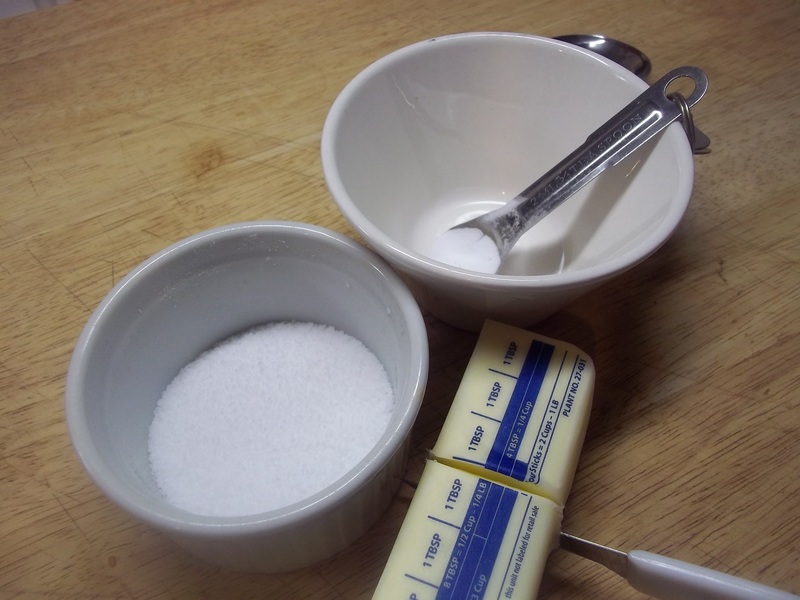 Stir in baking soda, salt, and melted butter. Chill and use as you would Ricotta. The cheese ended up so elastic when compressed that we plan to use it on fresh pizza. Great effort – well done for persevering. Thanks, but I just tried again and bombed. The “real thing” method left me with just a few quarts of really hot whey. I think the dogs and chickens will enjoy it. How much milk have you got?! Down to a quart and a half. I’m thinking more yogurt before it’s too late to use it.